Changing the standard of medical care for chronic brain & immune conditions with comprehensive natural medical treatment. Glutathione is a molecule which is abundant in most cells of the body. It is comprised of three amino acids--glycine, glutamic acid and cysteine. It has been coined by Dr. Mark Hyman as “the mother of all antioxidants” as it plays a role in neutralizing free radicals eliminating toxins from the body.1 Glutathione is highly concentrated in all cells in all organs, including brain tissue. The brain, being only 2% of the body weight, uses up 20% of the body’s total oxygen metabolism, making brain tissue particularly susceptible to reactive oxygen species and peroxide damage (metabolites that are formed in the use of oxygen). How does the Body make Glutathione and Why it Might be Low? Glutathione is naturally made in virtually all cells by first combining glutamate with cysteine and then adding glycine and ATP to gamma glutamylcysteine to make glutathione. The availability of cysteine is considered to be the rate limiting step in glutathione synthesis and because it has a sulfhydryl group (-SH group), it contributes to the conjugation and reduction properties of glutathione. Cysteine and Glutamine are both considered to be conditionally essential amino acids in the body. This means that they are usually made by the body naturally but during times of illness and high stress they can become depleted more rapidly. HOW DOES METHYLATION capacity affect glutathione production? 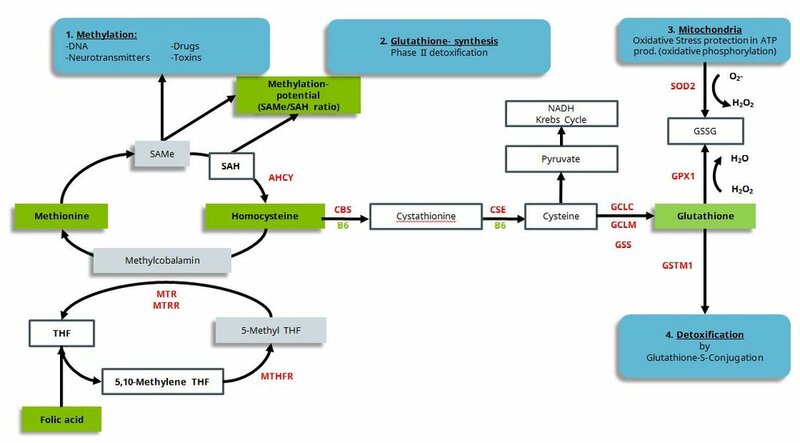 Further up in the glutathione production pathway, a group of genes known as the “CBS genes”, are responsible for the production of the enzyme cystathionine beta synthase which converts homocysteine to cystathionine (the precursor to cysteine) in a pathway known as step 1 of transsulfuration. Another group of genes that help the body get rid of sulphur amino acids are the MTHFR genes which take homocysteine and create methionine. Both methylation and transsulfuration function are components that we support when low glutathione is an issue. Essentially the body’s biochemistry is a series of interlocking gears, and if one gear fails to turn (that biochemical pathway gets jammed) there are downstream consequences as other gears stop moving or spin excessively. Once Methylation, and then Glutathione production is impaired, cellular detoxification and mitochondria function suffers. Then we see damage to the cellular structure, including the cell membrane which can trigger “danger responses” throughout the immune system. From my experience, this is where the root cause of much disease lies. From hormonal health, neurological health, mental health and more, our true capacity for health and healing lies in the function of each little cell and how “biochemically well” each cell is. From Cell Science Systems: Homocysteine, donor for methyl groups in methylation and precursor in glutathione biosynthesis, important in mitochondrial oxidative stress prevention and phase II detoxification. Why is Glutathione Important to the Body? As mentioned above, glutathione is needed to conduct several functions in the body and in autism we often consider glutathione to be the rate limiting step to neurological development. When deficient, these pathways can become compromised. Children on the spectrum have been found to have low levels of circulating glutathione compared to children not on the spectrum. Those with autism have also been found to have decreases in levels of cysteine--the rate limiting step in glutathione formation.3 Hence, those with autism can benefit from replenishing glutathione levels to allow for this reaction to take place optimally. The brain has built complex and nourishing glutathione delivery systems during development through astroglial cells; it is proposed that disruption of astroglial glutathione delivery is a mechanism in neurological disorders. 7 By providing anti-inflammatory care, a diet that support brain development & neural re-wiring and providing glutathione when needed, we’re improving concussion recovery outcomes. The Organic Acids Tests (OAT by Great Plains Laboratory) and DUTCH test (Dried Urine Test for Comprehensive Hormones by Precision Analytical) are both used to evaluate hormones, certain neurotransmitter markers and nutritional acid markers. Both test for a specific nutritional organic acid which has been found to be elevated if a person is deficient in glutathione. This testing may allow us to get a jump on low glutathione, supporting detoxification, using the building block N-acetyl-cystiene and further evaluating for issues with the CBS or COMT genes. These tests can be ran through an Naturopathic Doctor and may be covered under your Naturopathic insurance benefits. What is the process of nebulizing glutathione and why IS that form a good method of ingestion? A nebulizer is a device which provides a drug in the form of mist so that in can be inhaled into the lungs. Nebulized glutathione is a good form of supplementing, especially for those with chronic respiratory disorders since the molecules can be delivered directly to where it is needed. Nebulized forms of glutathione deliver the antioxidant as close to the brain as we can get through the upper respiratory tract and nasal passages. What other forms of glutathione are there? We also offer glutathione injections, though they can be achey to receive. Oral glutathione is an option as well, though these forms may be harder to absorb through the gastrointestinal tract. To aid absorption, liposomes forms of glutathione are available, but the preparations are typically pricey so in-office administration may make more sense for some. Kern JK, Geier DA, Adams JB, Garver CR, Audhya T, Geier MR. A clinical trial of glutathione supplementation in autism spectrum disorders. Med Sci Monit. 2011;17(12):CR677–CR682. Want to work with Dr. Nicole? If you're a new patient, get a FREE 15-minute consultation.